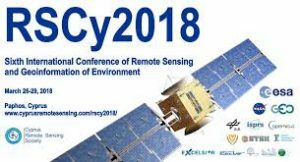 The 6th International Conference on Remote Sensing and Geoinformation of Environment (RSCy2018) will take place in Paphos, Cyprus, from 26 to 29 March 2018. It will give the opportunity to network with leading experts in the field of Remote Sensing and Geoinformation. During the conference, a poster will be presented by the RUS consortium.